If you're looking for a great (and cheap!) 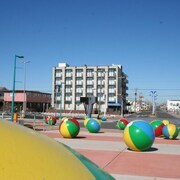 hotel in Cape May - Wildwood, CheapTickets is the best place to find them. We offer deals on the best 182 hotels throughout Cape May - Wildwood. No matter what you're looking for, we have options for you. Grab great rates on the 32 affordable 3-star hotels that are easy on the wallet without sacrificing comfort. Looking for more luxury? Try one of the 9, 4-star hotel accommodations in Cape May - Wildwood. No matter your budget needs, we've pulled out all the stops to make sure you have plenty of vacation options. Maybe you prefer to search for your hotel deals based on what each hotel offers? For example, let's say you just want to find a hotel or resort that has a pool to cool off in after a long day exploring Cape May - Wildwood. 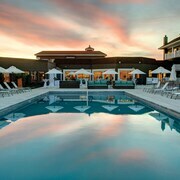 Scroll down to choose from the 80 hotels in Cape May - Wildwood that has a pool for guests. Or search for deals on Cape May - Wildwood hotels offering free wifi or breakfast, non-smoking rooms, and more! CheapTickets is here to be your personal travel agent for your next trip to Cape May - Wildwood. Get booking today! What hotels in Cape May - Wildwood offer free wifi access? Are there deals on Cape May - Wildwood hotels offering free breakfast? Yes! The only thing better than finding a great deal on a cheap hotel in Cape May - Wildwood is finding one that offers free breakfast. Grab some eggs, a waffle, or some healthy oatmeal before a day full of exploring Cape May - Wildwood and all that it has to offer. Below are just some of the many hotels that offer free breakfast in Cape May - Wildwood. Peter Shields Inn & Restaurant is a 3.50 star rated hotel property in Cape May - Wildwood that offers free breakfast. 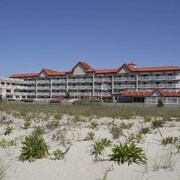 Summer Nites is a 3.00 star rated hotel property in Cape May - Wildwood that offers free breakfast. 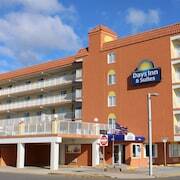 The Doctor's Inn is a 2.50 star rated hotel property in Cape May - Wildwood that offers free breakfast. What about deals on pet-friendly hotels in Cape May - Wildwood? Cape May - Wildwood is a great place to get outside and explore with your pets in tow so don't leave your furry friends behind. Below you'll find great deals on hotels in Cape May - Wildwood that allow pets. Don't forget to bring plenty of treats! 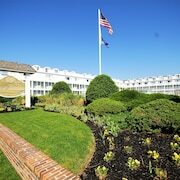 Cara Mara Resort is a popular, pet-friendly, 3.00 star hotel in Cape May - Wildwood. The Doctor's Inn is a popular, pet-friendly, 2.50 star hotel in Cape May - Wildwood. Jolly Roger Motel is a popular, pet-friendly, 2.00 star hotel in Cape May - Wildwood. Madison Avenue Beach Club Motel is a popular, pet-friendly, 2.00 star hotel in Cape May - Wildwood. Any good rates on Cape May - Wildwood hotels with restaurants? Absolutely. Don't want to deal with planning our all your meals on your trip to Cape May - Wildwood? We don't blame you. Keep the hangry away by staying in one of the 23 hotels that have restaurants. With a room at one of these spots, all it takes to get a good meal is hopping in the elevator. Check out some of the most popular hotels in Cape May - Wildwood that have restaurants below. Book Pan American HotelPan American Hotel is a 3.50 star hotel and has one or more restaurant options. Book The Reeds at Shelter HavenThe Reeds at Shelter Haven is a 4.00 star hotel and has one or more restaurant options. Book Coliseum Ocean ResortColiseum Ocean Resort is a 2.50 star hotel and has one or more restaurant options. Book La Mer Beachfront InnLa Mer Beachfront Inn is a 3.50 star hotel and has one or more restaurant options. 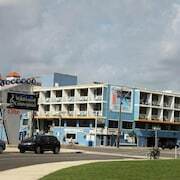 What are the cheapest hotels in Cape May - Wildwood with pools? What's better after a long day exploring Cape May - Wildwood then a relaxing dip in a pool? Finding the Cape May - Wildwood hotel you need for a bargain! Cool off and unwind at one of our 80 Cape May - Wildwood hotels with a pool. 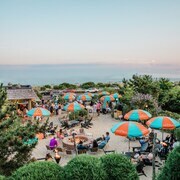 Browse some of the top deals on these hotels and resorts with pools in Cape May - Wildwood below, but be warned: You may not want to check out! Alante Oceanfront Motor has a pool and a 2.00 star rating. Diamond Crest Motel has a pool and a 2.00 star rating. Beach Terrace Motor Inn has a pool and a 2.50 star rating. Grand Hotel of Cape May has a pool and a 2.50 star rating. What hotels in Cape May - Wildwood offer parking for guests? Once you've made your way to Cape May - Wildwood, the last thing you want to deal with is finding parking close to your hotel. Avoid the hassle of parking around the block and carrying your luggage all the way to the lobby by booking one of our hotels with parking. Check out deals on some of the 82 hotels in Cape May - Wildwood that offer parking for guests. Harbor Light Family Resort This hotel has a 2.00-star rating. Beachcomber Resort This hotel has a 3.00-star rating. Clarem Happy Days Inn This hotel has a 2.00-star rating. Monterey Motel This hotel has a 2.00-star rating. Do Cape May - Wildwood hotels offer 24-hour concierge services? When you're on vacation, things don't always go according to plan. Travel with peace of mind when you book one of our 17 hotels in Cape May - Wildwood with 24-hour concierge service. That way you know help is always phone call or elevator ride away. Try The Star Inn. It's a 3.50 star rated hotel in Cape May - Wildwood that offers concierge services 24 hours a day. Try Avondale by the Sea Motel. It's a 2.50 star rated hotel in Cape May - Wildwood that offers concierge services 24 hours a day. Try Aquarius Motor Inn. It's a 2.50 star rated hotel in Cape May - Wildwood that offers concierge services 24 hours a day. Try Aqua Beach Hotel. It's a 2.50 star rated hotel in Cape May - Wildwood that offers concierge services 24 hours a day. What about low rates on non-smoking hotels in Cape May - Wildwood? Blue Water Motel This hotel has a 2.00-star rating. Hyland Motor Inn This hotel has a 2.00-star rating. Tropicana Motel This hotel has a 2.00-star rating. La Mer Beachfront Inn This hotel has a 3.50-star rating. What are the cheapest Cape May - Wildwood 3-star hotel deals? Our 3-star hotels bring you quality accommodations at a lower price point for the perfect, budget-friendly vacation in Cape May - Wildwood. With 32 3-star hotels throughout Cape May - Wildwood to choose from, you still have options. Browse our selection below. Montreal Beach Resort. With direct access to the beach, this Cape May hotel is within a 15-minute walk of Cape May Convention Hall, Easy Lynne Theater Company, and Colonial House. Cape May City Hall and Washington Street Mall are also within 15 minutes. La Mer Beachfront Inn. With direct access to the beach, this Cape May hotel is within 1 mi (2 km) of Nature Center of Cape May, Cape May Convention Hall, and Colonial House. Emlen Physick Estate and Cape May City Hall are also within 1 mi (2 km). Summer Nites. Situated near the beach, this bed & breakfast is within a 10-minute walk of Morey's Piers, Ocean Oasis Waterpark and Beach Club, and Gateway 26 Casino. Albert I Allen Memorial Park and Seaport Aquarium are also within 15 minutes. Beachcomber Resort. Situated near the beach, this condo is 1.7 mi (2.8 km) from Wetland's Institute and 2 mi (3.2 km) from Stone Harbor Bird Sanctuary. Grassy Sound Marina and Cape May Historical Museum are also within 6 mi (10 km). What are the best deals on 4-Star Hotels in Cape May - Wildwood? Cape May - Wildwood is full of hotels and it can be hard to narrow down where you really want to stay. Luckily, we've done that hard work for you be narrowing you from 182 hotels throughout Cape May - Wildwood, to the 9 4-star hotels in Cape May - Wildwood. Our 4-star hotels in Cape May - Wildwood are exactly what you need for your next family trip, romantic weekend, or solo getaway. Check out our most popular deals below. Congress Hall: This Cape May hotel is within approximately one-quarter mile of the Cape May Stage and the Cape May City Hall. The Emlen Physick Estate is a mile away. 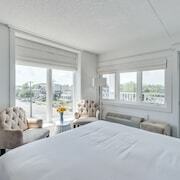 The Reeds at Shelter Haven: Situated near the bay, this boutique hotel is within 1 mi (2 km) of Wetland's Institute and Stone Harbor Bird Sanctuary. Cape May County Zoo is 4.8 mi (7.8 km) away. First time staying in Cape May. The rooms were very clean, fresh smelling, and nicely updated. My parents stayed with me in the bunkbed/queen bed room. Their only complaint was that there were no elevators to our 3rd floor. Our group had 2 oher rooms, and being on the 3rd and 2nd floors we had great views of the ocean from the decks. The staff was friendly but the accommodations were not the best. You have to walk outside to get to your room, the walls are very thin. You can hear other hotel guests talking, walking around, and your room shakes every time someone walks above your room or by your room. There were hotel guests making a lot of noise and partying so we couldn't sleep well. Although they do give parking, it is first come first serve and their lot is small. A lot of times we couldn't find parking. The hotel is close to the beach. This hotel is across from a sister hotel so you do enjoy that hotel's amenities which are lovely. We stayed in the original main building, our room was a converted attic. Okay, but certainly not worth the price we paid. Also not the caliber of its sister hotels. Exceeded my expectations. Friendly staff, gave my pup the royal treatment, great value. Had to cancel our reservation one month in advance due to a family situation, and were not refunded. Enough said. You have lost these frequent visitors to the Crest’s business. Do not book at this hotel. Do not stay at Beachside Resorts! The entire hotel was dirty, no phone in room and no tub stopper for bathing. I’m still itching from my stay at this hotel.